I have often written about the Fed's abysmal track record in managing the economy. Here Lacy Hunt and Van Hoisington of Hoisington Investment Management explain the reasons for the Fed's consistently poor track record. But I’ll let Lacy Hunt and Van Hoisington unpack the idea themselves. “Dual mandate” is one of the most commonly used phrases in U.S. central banking. The current Chair of the Federal Reserve often mentions it in both speeches and testimony to Congress. 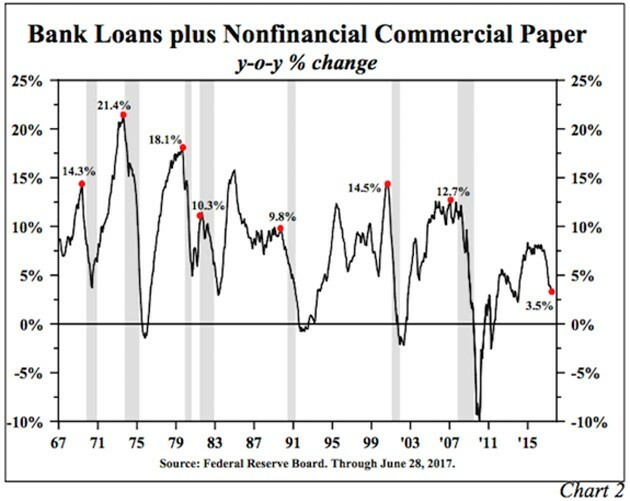 Not surprisingly, this is an extremely hot topic in monetary economics, and execution of this mandate has profound significance. What is the causal link between the mandate and the Fed’s capacity to act in a counter-cyclical fashion? How has the dual mandate morphed into the Phillips Curve? What are the arguments for and against a Phillips Curve based approach for conducting monetary policy? What does empirical research reveal? In view of the extreme over-indebtedness and other adverse initial conditions, what are the immediate consequences of using a Phillips Curve based dual mandate for the economy, the Fed and fixed income investors? To achieve the goals of this mandate (maximum employment, stable prices and moderate long-term rates), the Fed will inevitably tighten for too long and by too much. This occurs because considerable time elapses between the implementation of the monetary actions designed to follow the mandate and when the impact of those actions take effect on broader business conditions. By waiting to recognize a definitive change in inflation and unemployment, monetary policy changes will be pro-, not counter-cyclical. The time difference between leading or causative measures like the money and reserve aggregates, on the one hand, and the economically lagging series of the unemployment rate and inflation, on the other hand, can easily be three years or longer. This difference between the actions of the Fed and the reactions within the economy explains why the Fed historically has not begun easing cycles until the economy was either in, or on the cusp of, a recession. When the Fed takes action, relief is painfully slow in arriving. Importantly, the economic risks from adherence to this dual mandate are now much greater than historically due to the economy’s extreme over-indebtedness, poor demographics and a fragile global economy. To demonstrate, suppose that in the fourth quarter of this year, unemployment turns significantly higher while the inflation rate decelerates from its already subdued pace. The downturn that the Fed would be witnessing in the fourth quarter could be reflecting policy actions all the way back to the fourth quarter of 2015 when they initiated the current tightening cycle. This cumulative evidence is reflected in the monetary and credit aggregates (Charts 1 and 2). This change in economic fortunes might cause the Fed to accelerate the rate of growth in the monetary base and lower the policy rate in order to stimulate money and credit growth. However, the monetary and credit aggregates might not respond to these first steps until 2019 or even 2020, thus putting the Fed three years or more out of sync with the needs of the economy, suggesting a prolonged period of severe underperformance. Being out of step with the goals of a counter-cyclical monetary policy will arise as long as the Fed keys its decision-making on unemployment and inflation, rather than on maintaining financial stability, which focuses on the reserve, monetary and credit aggregates. Achieving such stability, however, is now much more difficult for the Fed than in the past. Until the economy became so heavily indebted, M2 was a consistent leading economic variable. Now M2 only leads recessions. Until the debt overhang is corrected (which does not appear to be in the immediate future), the velocity of money is likely to continue declining. 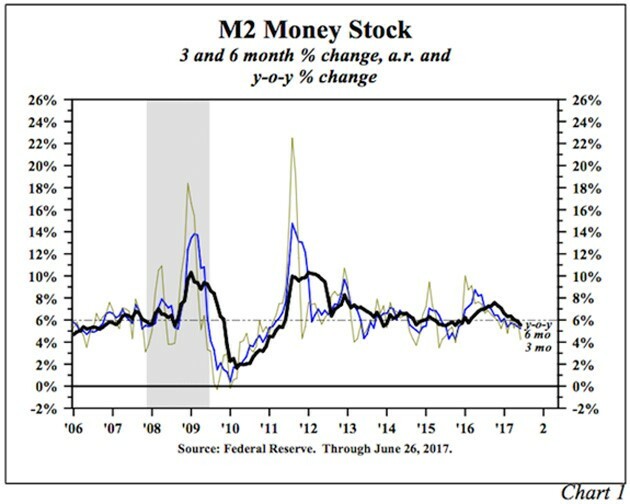 Thus, when the Fed eases in the future, the strong leading relationship between M2 and the economy will no longer prevail. There have always been lags between the time of a policy shift and evidence of that shift in the broader economy. However, in a heavily indebted economy, with the velocity of money likely falling further, and policy rates close to the zero bound, the Fed’s current capabilities are decidedly asymmetric. Any easing actions taken now would be far less powerful than the steps taken in the prior tightening cycle. Thus, by keying off the dual mandate in an economy with a severe debt overhang, the Fed would be more disadvantaged than normal in trying to come to the quick aid of a faltering economy. The Federal Reserve Reform Act of 1977 does not spell out the nature of the trade-off between the unemployment rate and the inflation rate, nor does it say how the Fed should act if the mandates are at odds in terms of the policy approach. The potential problems that arise from this lack of clarity are clearly illustrated by the current situation. The Fed has extended the current tightening cycle twice this year, with the latest move on June 14. At the time of the latest decision, headline and core CPI had year-to-date price increases of 1% and 1.3%, respectively, substantially below their 2% target. Additionally, the latest twelve-month increases in both of these inflation gauges were below the 2% target. Only the unemployment rate warranted more restraint. This means that inflation and unemployment are at odds, thus the dual mandate is dead. It now boils down to the Fed’s interpretation of the Phillips Curve. The most definitive study of the Fed’s operations is widely considered to be the multi-volume series, A History of the Federal Reserve written by the late Carnegie Mellon economist Alan Meltzer (1928-2017). Volume I examines the span from the creation of the Fed in 1913 until the accord with the Treasury in 1951. Volume II, Book 1 covers the years from the accord in 1951 until 1969, while Volume II, Book 2 discusses the period from 1970 until the end of the great inflation period in the mid-1980s. In this scholarly historical examination, Meltzer, on the basis of price and financial stability, gave the Fed high marks in only one-fourth of its years of operation. Meltzer made many seminal contributions to economics, including identifying the algebraic determinants of the money multiplier and outlining the transmission of monetary policy actions to the real economy. In his 2014 paper, “Recent Major Fed Errors and Better Alternatives,” Meltzer summarized the root cause of the Fed’s policy errors and long record of failed forecasts as follows: “The Fed’s error was to rely on less reliable models like the Phillips Curve ... that ignore or severely limit the role of money, credit, and relative prices.” By focusing on the Phillips Curve, Meltzer contends that the Federal Open Market Committee (FOMC) overemphasizes information in monthly and quarterly data periods while giving insufficient attention to persistent trends in money and credit, which are the very aggregates that the Fed supplies. To paraphrase Meltzer, by relying on the Phillips Curve, the FOMC avoids developing a strategic view of their role and the complex world in which they operate. As the massive credit buildup leading up to 2007 illustrates, the Phillips Curve mandate also diverts the Fed’s attention from important regulatory matters that can have extremely consequential and long lasting macro implications. No less an authority than Paul Volcker explained publicly and to the staff that the Phillips Curve was unreliable and not useful. As Chair, he gave many talks about what I have called the anti-Phillips Curve. Volcker claimed repeatedly that the best way to reduce unemployment was to reduce expected inflation. He did not use Phillips Curve forecasts. He ran a very successful policy. Alan Greenspan was less outspoken, but he also rejected Phillips Curve forecasts as unreliable. Instead of finding a better model, the staff resumed use of Phillips Curve forecasts. They were again unreliable as should be evident from the repeated prediction errors ... Year after year, growth and employment are below forecast. One might hope that repeated forecast errors all in the same direction would raise doubts about the usefulness of the model or models and initiate search for a better model. This does not appear to have happened. In the three years since this prophetic passage, the string of unbroken economic forecasts continued unabated. The Phillips Curve represents the relationship between the rate of wage inflation and the unemployment rate. In a 1958 study, New Zealand economist A. W. H. (Bill) Phillips (1914-1975) found an inverse relationship between wage inflation and the unemployment rate in the United Kingdom from 1861 to 1957. A high unemployment rate correlated with slowly increasing wages, while a lower unemployment rate correlated with rapidly rising wages. According to Phillips, the reasoning for this finding was that the lower the unemployment rate, the tighter the labor market, thus firms would raise wages to attract scarce workers. Conversely, at higher rates of unemployment the pressure on wages abated. Thus, this curve attempts to capture a cyclical process that can be used for evaluating the business cycle. This curve presumes the average relationship between wage demands and the unemployment rate is stable, thus there is a rate of wage inflation that results if a particular level of unemployment persists over time. As time has passed, Phillips Curve proponents have also asserted that a stable relationship exists between the unemployment rate and the overall rate of inflation, not just that for wages. The original Phillips Curve shows a downward sloping line on a graph, with wage inflation on the vertical axis and the unemployment rate on the horizontal axis. Friedman and Phelps argued that the government could not permanently trade higher inflation for lower unemployment. When the natural rate of unemployment prevails, the real wage is constant. Workers who expect a given rate of inflation insist that wages increase at the same rate to prevent the erosion of their purchasing power. Consistent with Friedman and Phelps, consider the effects of a monetary policy designed to expand economic activity in an attempt to lower the unemployment rate below its natural rate. The resulting increase in demand (pricing power) encourages firms to raise prices faster than workers anticipate. With higher revenues, firms are willing to employ more workers at the old wage rates and in some cases are willing to somewhat boost them. With rising wages, workers willingly supply more labor, which leads to a drop in the unemployment rate. Initially, they do not realize that their purchasing power has eroded since prices have advanced more rapidly than expected. In this initial period workers suffer from what is known as a “money illusion” – the rise in nominal wages is not equal to the rise in real wages. As workers come to anticipate higher rates of price inflation over time, they see through the money illusion, and less labor is supplied and demanded. The real wage is restored to its old level, and the unemployment rate returns to its natural rate. Today, the opposite case is present. Monetary restraint is limiting demand and eroding pricing power, causing employers to restrain wages. Once workers realize this restraint is not a cut in real wages, they will continue to supply the same amount of labor. The Phillips Curve trade-off does not exist in either of the two alternative situations. Phelps and Friedman also distinguish between these effects over the “short run” and the “long run”. Phillips Curves only prevail so long as the average rate of wage inflation remains fairly constant. Only in such a limited time frame will wage inflation and unemployment be significantly inversely related. Once the higher inflation is fully incorporated into expectations, unemployment returns to the natural rate, with the result that the natural rate of unemployment is compatible with any rate of inflation. These long and short run relationships can be combined in an “expectations augmented” Phillips Curve. The quicker workers adjust price expectations to changes in the actual rate of inflation, the quicker the unemployment rate will return to the natural rate and the less successful the government will be in reducing unemployment through monetary and fiscal policies. The expectations augmented Phillips Curve approach is used in and appears to play a major role in the Federal Reserve’s large-scale econometric model. We examined the relationship between percent changes in real average hourly earnings and the unemployment rate from 1965 through 2016 – the entire historical record for wages. This sample is comprised of over 600 monthly observations (Chart 3). The trendline fitted through the observations does have a slightly negative tilt, but the line is not statistically different from a straight horizontal line, which signifies a total lack of responsiveness of real wage changes to the unemployment rate. The adjusted R2 is 0.04, which is not statistically significant. Thus, our empirical findings are consistent with the causality outlined – that the Phillips Curve assumption is not valid. 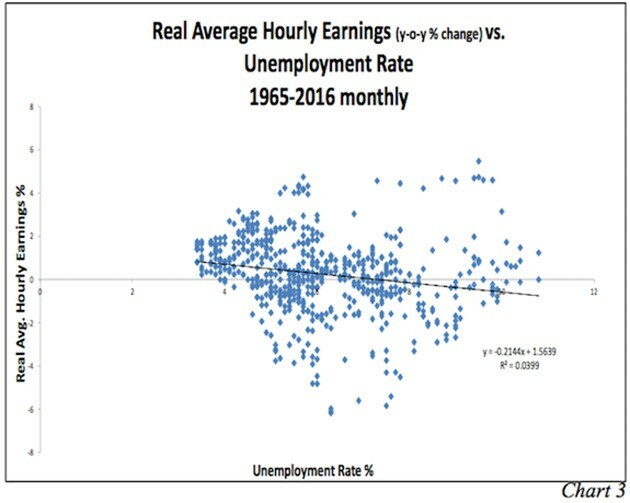 Cherry picking through the data points can identify limited time periods when a greater inverse relationship exists between wage increases and the unemployment rate. As many researchers have pointed out this was true of the 1960s. From the first half to the second half of the 1960s, nonfarm business sector compensation per hour (a widely followed measure of labor compensation) increased from 3.6% per annum to 5.9% as the unemployment rate fell from 5.7% to 3.8%. The critical point is that these individual episodes of an apparent Phillips Curve trade-off are too weak and too infrequent to establish an enduring relationship over time. The adherents to the Phillips Curve do not accept these various empirical criticisms. For many decades, they insist that the poor results are due to the fact that the basic relationship has not been properly quantified. They point to the problems capturing leads and lags between the unemployment rate and wage changes as well as difficulties that arise from measuring expectations and working with aggregate data. For followers of the Phillips Curve, it is just a matter of time before these issues of statistical quantification are resolved. These arguments are not compelling, yet they have been used repeatedly for at least a half a century. As the years have passed, the constantly restated Phillips Curve formulations have regularly missed major business cycle developments, a pattern which has been evident in the Fed’s record. The Fed presided over the worst U.S. peacetime inflation from 1977 to 1981, and tightened before all of the recessions after 1977. The Fed did contain the Panic of 2008 with excellent lender of last resort tools, but a far better result might have been achieved if the Fed had learned the lesson of the 1920s and prevented the massive buildup of debt prior to 2008 that the regulatory powers of the Fed were designed to prevent. For most of the past eight years, the frequently restated Phillips Curve models have pointed to a sustained acceleration in wage and price inflation that has failed to materialize. These failures not only impair monetary policy but also portfolio decisions based on the presumed efficacy of the Phillips Curve and the reliability of the dual mandate. Based on the slowdown in the monetary and credit aggregates, and the continuing fall in the velocity of money, the rate of inflation is more likely to moderate rather than accelerate, even as the unemployment rate in May 2017 stood at a sixteen year low. Thus, inflation, on average, moved lower during this current expansion, contradicting the forecasts for higher inflation based on the Phillips Curve concept. the velocity of money, the rate of inflation is more likely to moderate rather than accelerate, even as the unemployment rate in May 2017 stood at a sixteen year low. Thus, inflation, on average, moved lower during this current expansion, contradicting the forecasts for higher inflation based on the Phillips Curve concept. For the Fed, the more advisable approach would be to pull the Phillips Curve relationships from their model and their policy decisions. Instead, they should rely on capturing the strategic role of the monetary transmission mechanism and its potentiality for moving through the reserve, monetary and credit aggregates in a highly leveraged economy. If the Phillips Curve proponents are right, and the quantification efforts are eventually proved to be valid, then at that point they can be inserted into the Fed’s model as well as into their subjective decision-making process. This is relevant to investors as well. If adherence to the dual mandate induces financial insatiability, then investor performance, like overall economic activity, will be directly influenced. If the Fed’s mandate consistently leads them in the wrong direction, then long-term investors may often be forced to construct portfolios that are contradictory to the error-prone words, forecasts and policy actions of the FOMC. Moreover, investors should expect that the Fed’s actions will create substantially more volatility in the financial markets and particularly so over the short-term. Operating with strategic views and multi-year trends, rather than trying to focus on the Fed-generated noise in many monthly and quarterly indicators, may be a preferred method of generating investor returns. Our economic view for 2017 is unchanged and continues to suggest that long-term Treasury bond yields will work irregularly lower. The latest trends in the reserve, monetary and credit aggregates along with the velocity of money point to 2% nominal GDP growth for the full year, down from 3% in 2016. This would be the third consecutive year of decelerating nominal GDP growth and the lowest since the Great Recession. This suggests that the secular low in bond yields remains well in the future.